Apples have always been a favorite snack of mine, but recently I’ve been on an apple chip kick. There’s nothing better than a sweet crunch to satisfy any cravings I’m having. With one apple having approximately 20 grams of sugar, I don’t feel too guilty about having a bag or two. Buying bags of apple chips adds up pretty quickly and can get a bit pricy, especially with how many I go through. 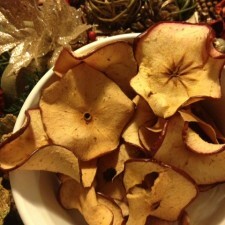 This morning I decided to make my own apple chips, which was actually a fun process. I absolutely love apples and coconut oil, just like my recipe for oatmeal and steamed apples, so of course I incorporated this into my apple chip recipe. Having just a touch of coconut oil on the apples gives some healthy fats, as well as a great flavor. The entire process takes about 2 hours, so be prepared to stay at home for a little while! If you’re not wanting to use coconut oil in this recipe, substitute it with a coconut oil cooking spray. This way, you’ll get the same enhanced flavor without the added fat. 1. Preheat oven to 250 degrees. Line baking sheets with parchment paper or foil. 2. Cut apples into extremely thin pieces, about 2 centimeters in width. 3. Evenly spread apples on lined baking sheets and drizzle melted coconut oil over the apples. 4. Place apples in oven for 1.5 to 2 hours, turning apples every 25 minute. 5. Once apples are dry and crisp, remove from oven and place on a cool surface. For an added sweetness, sprinkle apples with stevia and cinnamon. I used red apples for this recipe, but feel free to use your favorite kind. These apple chips are definitely addicting, so the bigger the batch, the better! I think you must have meant 2 mm thick, instead of 2 cm. 2 cm is pretty thick for a slice that becomes a chip in the oven. Yes? No? Curious about what you meant there. I’ve never made these before, and would like to. 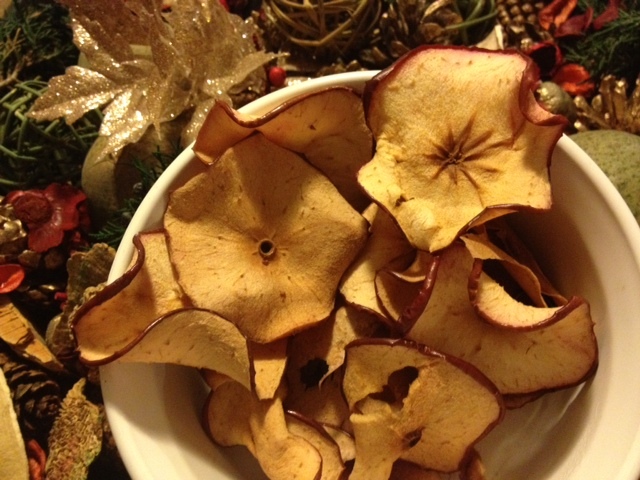 Lorie – When I made these apple chips, I tried to cut the apple as think as possible with a large knife. There were slices that were larger than others, so those did take a little longer to bake, but honestly just try to get them as thin as possible. The apple chips turned out amazing though and were gone in one sitting! Definitely try to make a large batch if you want them to last 🙂 Hope this helps.